On a Tuesday morning not long ago, Samin Sharma strolled into his operating room on the fifth floor of Mount Sinai Medical Center in Manhattan and stood over his patient. The doctor’s assistants had already inserted a thin plastic catheter into a blood vessel in the man’s leg, threaded it into his badly clogged left coronary artery, slid a metal wire tipped with a tiny balloonlike device through the catheter, and scrubbed the offending artery clean. Now, squinting at a television monitor showing a real-time X-ray of the patient’s struggling heart, Sharma began manipulating a second wire to insert a stent, a tiny metal device resembling the springy coil of a ballpoint pen, to keep the offending artery open. It was at about that time that the patient, a 60-year-old television executive, spoke up. He had been anesthetized locally, affording him the unique privilege of watching Sharma save his life. Sharma is a 48-year-old cardiologist who specializes in angioplasty, the increasingly popular minimally invasive procedure he was in the middle of performing. If he finished the job correctly—if the stent he chose fit properly and he installed it without a rupture—blood would again rush through the artery unfettered, helping the man’s heart pump at something like normal capacity. The slightest misstep, however, could burst the vessel, causing a heart attack and, perhaps, even death. Sharma spoke again. “Okay, my friend. I want you to take a deep breath now.” He needed the patient to keep perfectly still. With the flick of a finger, Sharma delicately placed the stent. Another flick, and the balloon was withdrawn. On the monitor, the clogged artery opened and the stent held; blood flushed easily past where the blockage used to be. Sharma gave a nod, left the man to be stitched up by the others, and headed back to his office for a Frappucino. He’d been at the table all of ten minutes. This was Sharma’s third patient of the day, and he was scheduled for fourteen more. Each week he does about 40; each year, at least 1,100. No one in the state even comes close to doing as many; the runner-up, in Buffalo, does something like 800. 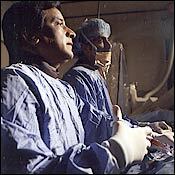 Not only is Sharma one of the most popular doctors for angioplasty in New York; as a matter of statistical fact, he has the state’s single-lowest mortality rate. And in New York, where everyone is watching, that now matters quite a lot. In 1989, New York became the first state in the nation to make public the mortality rates of its heart surgeons. Report cards for two different procedures, coronary bypass and angioplasty, were chosen as the standards by which the entire profession would be judged—a sort of litmus test for the skill of a given surgeon or hospital. The mortality numbers, risk-adjusted by age and other factors, are released every year or so on the Internet and reprinted in newspapers for all to see, hospital by hospital and doctor by doctor. Ending years of private, clubby surgeon culture, the public report cards were intended to shine a light on poor surgeons and encourage a kind of best-practices ethic across the state. If the system worked, mortality rates would fall everywhere from Oswego to NYU. At first glance, the system seems to have made an enormous difference. Although there’s no satisfying way to compare our risk-adjusted death rates with those of other states (most of which only have data from Medicare patients, who tend to be sicker and therefore skew the sample), the most recent data suggest that in the past fifteen years, New York’s coronary-bypass surgeons have improved their mortality rates to the point that they are, on average, just one-third of what they were. Sharma’s risk-adjusted mortality rate in the latest angioplasty report is an astonishing 0.1 percent, the state’s lowest. In eleven years, he has been the only doctor to have consistently earned the state’s coveted double asterisk, which designates a surgeon with numbers far below the norm. These days, plenty of his colleagues have low numbers, too; everyone has drifted downward together. Like the children of Lake Wobegon, the surgeons of New York are all, apparently, above average. But the statisticians who devised the report cards have been tormented by a persistent, intractable glitch in the system: It involves human beings. 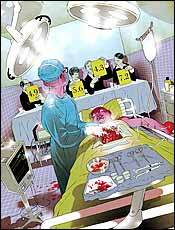 From the start, it was clear that surgeons’ careers were on the line as well as patients’ lives, and even before the first set of data was released, leaders in the heart-surgery community warned with an air of eerie certainty that the threat of public exposure would create a chilling effect—influencing surgeons to turn their backs on the sickest patients in order to prop up their personal success records. And consider this: Research shows that New Yorkers are more prone to dying from heart attacks than people in any other state, and the death rate from heart disease in the New York metropolitan area remains disproportionately high. There could be something wrong with our diets. It could be the stress of living here. But it’s also possible that another factor plays a part: Just as more people than ever are dying of heart disease in New York, the very system designed to make heart surgery safer here may be convincing surgeons to turn patients away. Choosing a heart surgeon has long been more of an art than a science. Aside from word of mouth, there was once no verifiable way of even guessing at who was the best. Surgeons perceived to be at the top of their field were the ones who had the most patients sent to them by cardiologists—and, in a crazy loop, those high referral numbers further fueled the doctors’ reputations. That began to change in the seventies. At that time, state health officials would examine the mortality rates of hospitals every five years or so, and when they did were startled to find wild disparities—11 percent in some places, nearly zero percent in others. As alarming as that seemed, there was no real way to compare hospitals, because each compiled its own mortality statistics in different ways and included different procedures. The first steps toward standardization took place under David Axelrod, the hard-nosed commissioner of health under New York governors Hugh Carey and Mario Cuomo. Hospitals offered any number of procedures, from transplants to valve replacements, but Axelrod settled on coronary-bypass surgery as the common denominator—the standard by which all hospitals would be judged. Bypass was both the most important lifesaving procedure and among the most standardized of techniques (measuring valve replacements and angioplasty came later). The decision to share these mortality figures didn’t come naturally to a profession that prides itself on discretion. When Axelrod tried to make the scores public in 1989, the state initially balked. Newsday then sued to make them public and won. The state finally released its first set of coronary-bypass numbers in late 1991. The new statistical glasnost did bring about a general improvement in surgical technique. Some of the underperforming heart programs began to adopt the practices of the best ones: Certain hospitals, for example, began stabilizing a patient before operating, the way the top ones do. Recorded mortalities plummeted. In the first year of the program, the death rate for bypass surgery dropped from 3.52 to 3.14 percent—a decrease of 11 percent. The rate for 2003, the most recent year available, is 1.6 percent. In time, so many doctors have become so good that the minute differences between them are virtually moot. “If one hospital has the lowest risk-adjusted mortality rate, that doesn’t mean that they’re statistically better than the third lowest or the second or the fourth or the fifth,” Ed Hannan says. If you’re a hard case, a recent study found, four out of five doctors in New York would think twice before operating on you. Another operation that’s occasionally added is closure of the patent foramen ovale, an opening between the right and left atrium of the heart. “Twenty percent of the population has it,” says Brown. “But doctors close it to take the patient off the list.” Non-heart-related disorders like AIDS or leukemia are not recognized risk factors in the data, but they make it less likely that a patient will get out of the hospital alive. Some doctors inevitably pass those patients along. The gaming problem isn’t just about hospitals’ and doctors’ reputations; it’s also about money. Heart procedures typically contribute up to a third of a hospital’s total revenue. Heart surgery—because it requires relatively short hospital stays and attracts an older, more affluent patient pool—is one of the few things hospitals do that turn a consistent profit. Competing for market share in treating heart disease, hospitals have begun using the state report cards as marketing tools, advertising their doctors as “low mortality” surgeons. Many also target and recruit low-scoring doctors from rival hospitals. Any double-asterisk doctor often fields offers from several medical centers; Sharma, for example, was heavily courted recently by Lenox Hill after Columbia poached Lenox Hill’s entire angioplasty program, but Mount Sinai paid handsomely to retain him. Faced with a lucrative new game to play, hospitals and doctors are playing to win. Consider, for instance, a case that would fall into more of a gray area than that of the 60-year-old TV executive. Let’s say, instead, it’s a much older man, one who comes into the hospital with a massive heart attack, and on top of that he’s in cardiogenic shock, meaning that his blood pressure is dangerously low. If you do nothing, there’s perhaps a 95 percent chance he’ll die; if you give him an angioplasty, the chance of death still lingers at 55 percent. As a cardiologist, do you make a hopeless case only slightly less hopeless, put the patient and family through a dangerous and expensive ordeal, and risk ruining your own mortality rate? Or do you walk away? Heart surgery is one of the few things hospitals do that turn a consistent profit. Faced with a lucrative new game to play, hospitals and doctors are playing to win. The problem with decisions is that not every doctor makes wise ones—and “futility” is a matter of opinion. David Adams, who came from the Brigham and Women’s Hospital at Harvard a few years ago to chair the heart-surgery program at Mount Sinai, remembers a young woman who came to his office late last spring. Her age and her overall health made her seem like a low risk on paper, but before she’d come to see him she’d had an infection in her heart valve that caused a leak that in turn sent her spiraling into gross heart failure. To take on her case, doctors essentially would have had to rebuild the whole top of her heart. Several surgeons turned her down; whether it was because of the risk of public exposure or the practice of good medicine is an open question.